Crypto currencies in general, and Bitcoin in particular; are going on the path of their biggest surge in the previous weeks amid the denial by the President of European Union’s Central Bank of the rumors of putting a ban on the crypto currencies. Yesterday, during the early trading Bitcoin registered a surge of 7 % thereby making it gain USD 400 amounting to the addendum of USD 7.7 Billion in its total market cap. 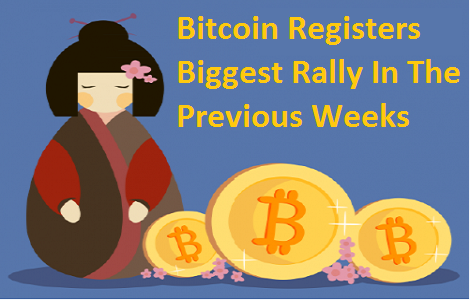 In the previous week too, Bitcoin had bounced up from the ongoing turbulence – thereby, upgrading its value by more than USD 1100 amounting to an increment of USD 19 billion in the total market capitalization. However, there are no two views regarding the volatile nature of crypto currencies and people remaining cautious of the high volatility in the prices of Ripple, Ethereum, and Bitcoin and such other crypto currencies. Mr. Mario Draghi who happens to be the president of European Union’s Central Bank has refuted to the rumors of the bank to ban the practice of initial coin offerings and crypto currency trading, in a video conference interview where investors for submitting their queries regarding the future upcoming regulatory framework for crypto currencies. Mr. Mario Draghi came down straight to the point regarding the question if the European Union’s Central Bank going to all together ban the Bitcoin or is about to bring up some regulatory measures for crypto currencies by espousing his views as, it is not the responsibility the European Union’s Central Bank to tackle such issues. It is simply out of domain of Bank’s regulatory duties and powers. Many monetary pundits and Wall Street’s bigwigs were in a certain kind of cynicism regarding the future of crypto currencies when World Bank president had made an inept comparison between crypto currencies and Ponzi schemes during the last week. However, this affirmative statement from the European Union's Central Bank has come up as wind of hope and positivity for the crypto investors that it is not the business of ECB to regulate crypto world. Probably, this is the reason that people have come up with increased enthusiasm which is culminating in the rising of prices of Bitcoin which was long due! With this news the Bitcoin has benefited tremendously as compared to other major crypto currencies which too have registered an increment in their pricing. Ethereum has jumped to 6 % even before the clock ticked 9 and Ripple has rallied by 4 %. Although, the biggest beneficiary of this news is Litecoin which surged by a whopping percentage increment amounting of 38 %.